Discussion in 'Movies, Plays, and Documentaries about Scientology' started by CommunicatorIC, Feb 22, 2018. 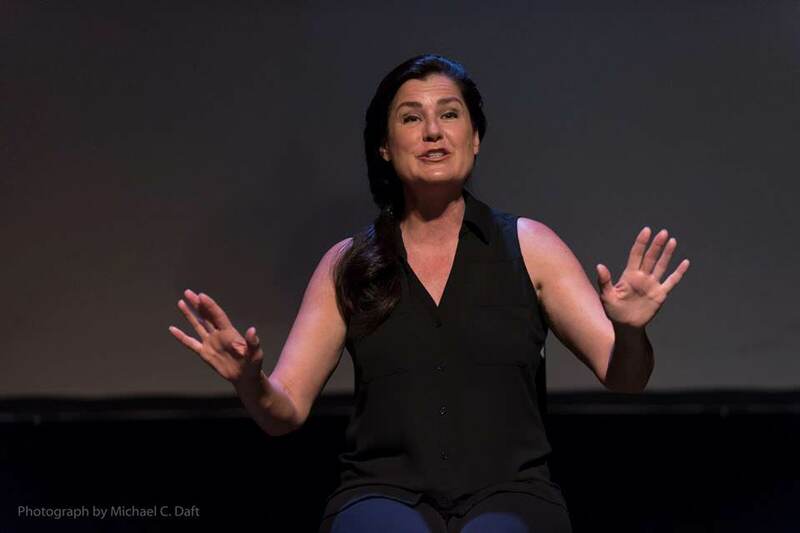 PODCAST: Daytime After Dark welcomes Cathy Schenkelberg to discuss her one-woman "Squeeze My Cans" show about Scientology. 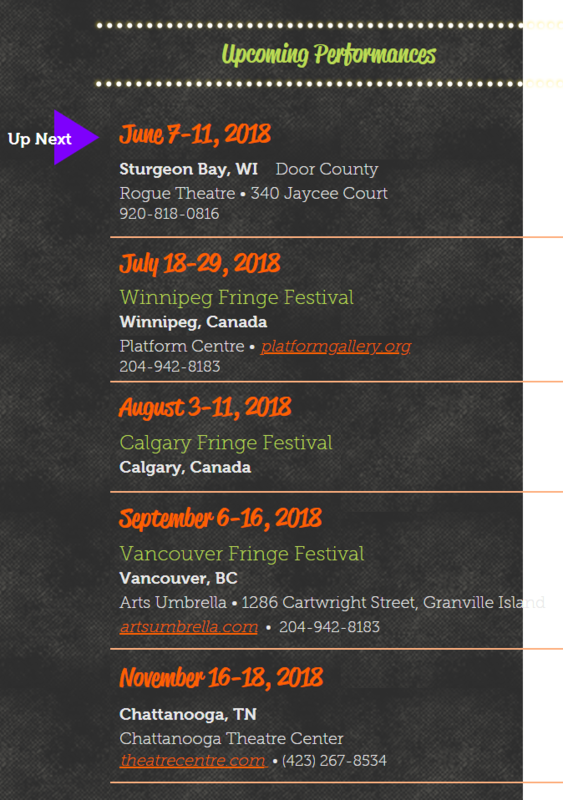 Squeeze My Cans Show about Scientology -- 2018 Dates. Former Scientologist, Cathy Schenkelberg, premieres her solo show at Rogue Theater. The Church of Scientology had actress Cathy Schenkelberg for 14 years; it took another five years to leave them behind in the face of harassing phone calls, midnight knocks on her door by “outreach” staffers, an expensive custody battle and constant paranoia about the monitoring of her every move. She has the courage to tell this hilarious and horrifying story under the direction of Shirley Anderson with sound and projection design by Victoria Deiorio. Her story premieres in her new original solo show, Squeeze My Cans, for four performances, June 7-10, at Rogue Theater in Sturgeon Bay. Squeeze My Cans shows June 7-10, Thursday-Saturday at 7:30 pm and Sunday at 2 pm. The June 7 performance is a special pay-what-you-can preview, with proceeds benefiting HELP of Door County. Rogue Theater in Sturgeon Bay, WI presents Squeeze My Cans, June 7-10, 2018. 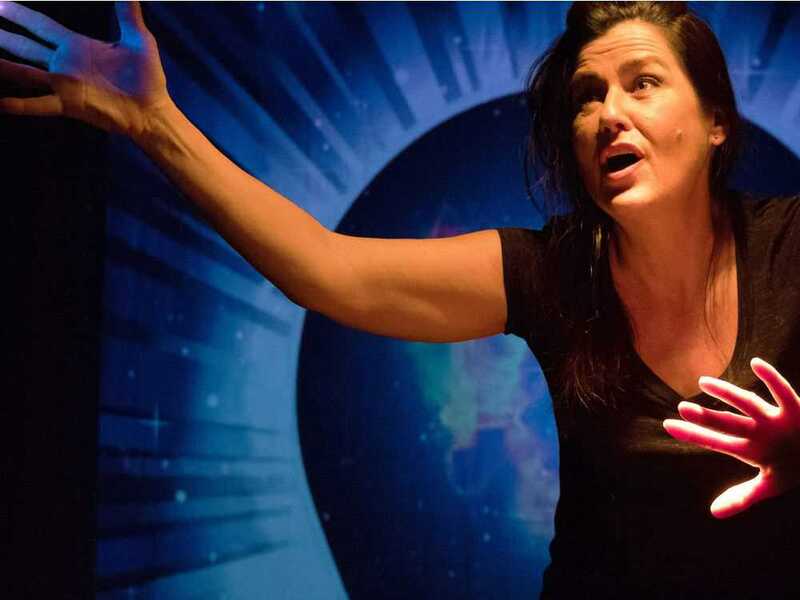 STURGEON BAY - Former Church of Scientology member Cathy Schenkelberg performs her solo show about her experience, "Squeeze My Cans," four times this week on Rogue Theater's stage. Have you ever wondered if Bozo was a suppressive person? Have you ever considered what it might be like to audition to be Tom Cruise's girlfriend? What would you do if the carrot of spiritual freedom was dangled in front of you, waiting to be seized? Schenkelberg decided to chase it and what she found was Scientology, where she spent most of her young adult life. After years of studying and searching, she found herself blowing alien life forms off her body, farther than ever from who she had hoped to be. Now, Schenkelberg returns to share that hilarious and horrifying story in this no-holds-barred cautionary tale of how she survived not just those 14 years as a member but another 5 years to leave Scientology behind in the face of harassing phone calls, midnight knocks on her door by “outreach” staffers, an expensive custody battle and constant paranoia about the monitoring of her every move..
A Nebraska native and veteran performer is bringing her experiences with Scientology to the forefront when her solo show “Squeeze My Cans” opens on Thursday in Sturgeon Bay. Cathy Schenkelberg, a popular voice-over artist who also appeared on Chicago Fire and The Bozo Show, was a member of Scientology for 14 years before leaving the church in 2009. Surviving Scientology's suppression - Actor shares her story about life after religion. And anyway, after spending close to a million dollars at the church to achieve one of the highest ranks possible — an OT VII — she effectively chucked it all when she realized her continued participation in the church would risk not only her sanity but her relationship with her only daughter. That story is recalled in the one-woman show Squeeze My Cans, a bawdy-sounding reference to the metal cylinders attached to an e-meter, employed to measure electrodermal variations in a Scientologist’s body during "audit" sessions. It’s a hair-raising story, but it’s told in an entertaining and engaging manner that transcends the subject of the religion started by science fiction author L. Ron Hubbard. Cathy Schenkelberg’s Squeeze My Cans which runs in the Artpoint Gallery takes its audiences into the dangerously bizarre world of Scientology where Schenkelberg was lost for almost two decades. During one of the first indoctrination sessions of Scientology, the client is given a personality test during which they are asked to hold a pair of cans hooked up by wires to a kind of lie detector machine, hence the title of Schenkelberg’s show. If you think the whole holding cans thing sounds a tad silly or weird then fasten your seat belts for what follows. Because her show is meant to be entertaining as well as informative and not simply a lecture, Schenkelberg layers it with a great deal of humour and a most energetic performance. Under all those laughs is the heartache Schenkelberg suffered by giving herself over body, soul and pocketbook to the snake-oil salesmen. Schenkelberg held Saturday’s capacity audience in the palm of her most talented hands for 73 minutes, and I predict word of mouth will have her next five shows sell out well in advance so get your tickets early. 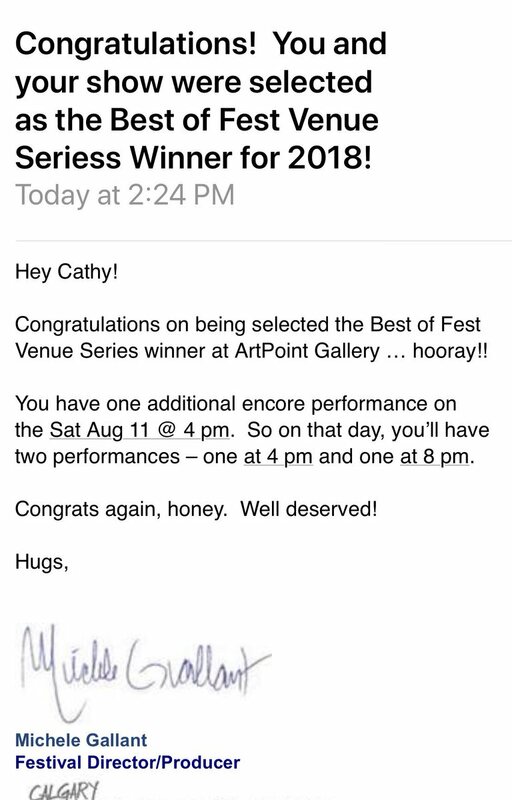 Cathy Schenkelberg's one-woman Squeeze My Cans show about Scientology selected as Best of Fest Venue Series Winner for 2018 at the Calgary Fringe Festival. Story tweeted. Quotations adding content, retweets and replies obviously welcome. 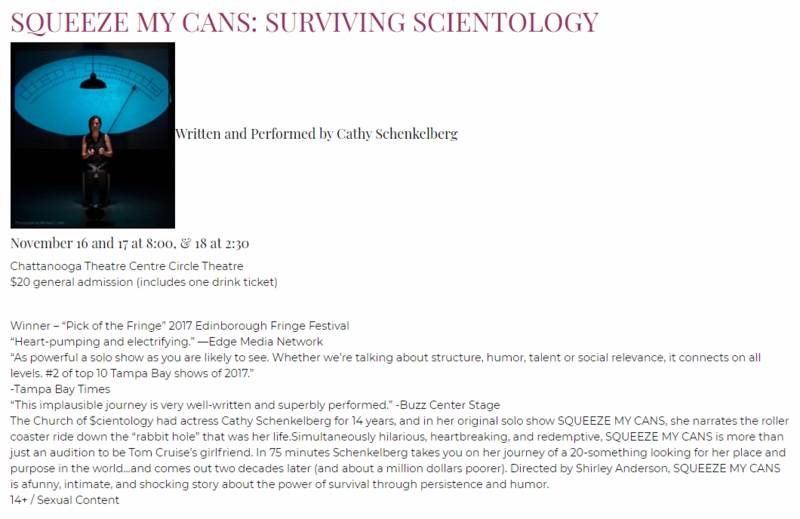 PODCAST: Radio interview with Cathy Schenkelberg about her one-woman show "Squeeze My Cans: Surviving Scientology." 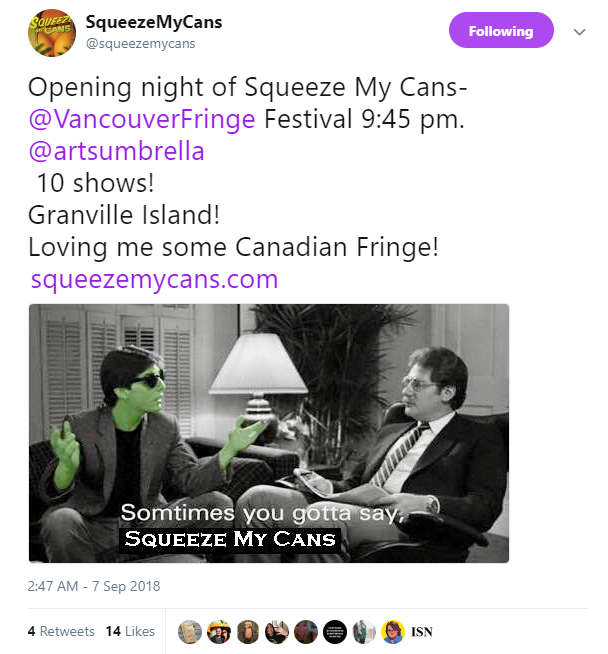 The one-woman Squeeze My Cans show about Scientology now at the Vancouver Fringe Festival. 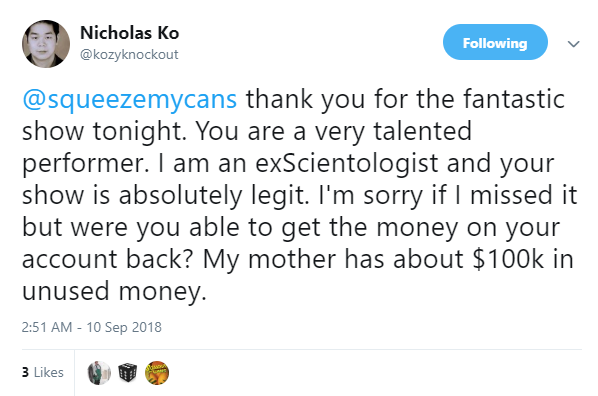 Nicholas Ko on the one-woman Squeeze My Cans show about Scientology. 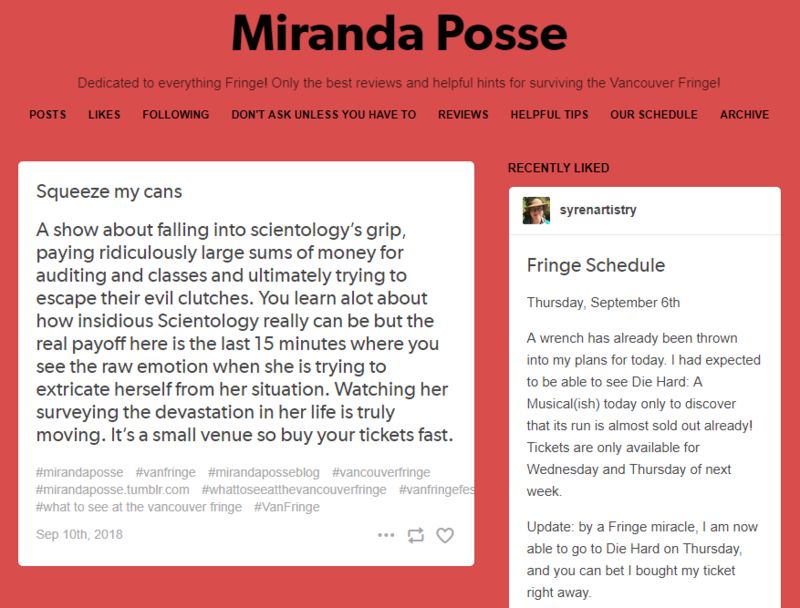 Miranda Posse on the one-woman Squeeze My Cans show about Scientology. A show about falling into scientology’s grip, paying ridiculously large sums of money for auditing and classes and ultimately trying to escape their evil clutches. You learn alot about how insidious Scientology really can be but the real payoff here is the last 15 minutes where you see the raw emotion when she is trying to extricate herself from her situation. Watching her surveying the devastation in her life is truly moving. It’s a small venue so buy your tickets fast. 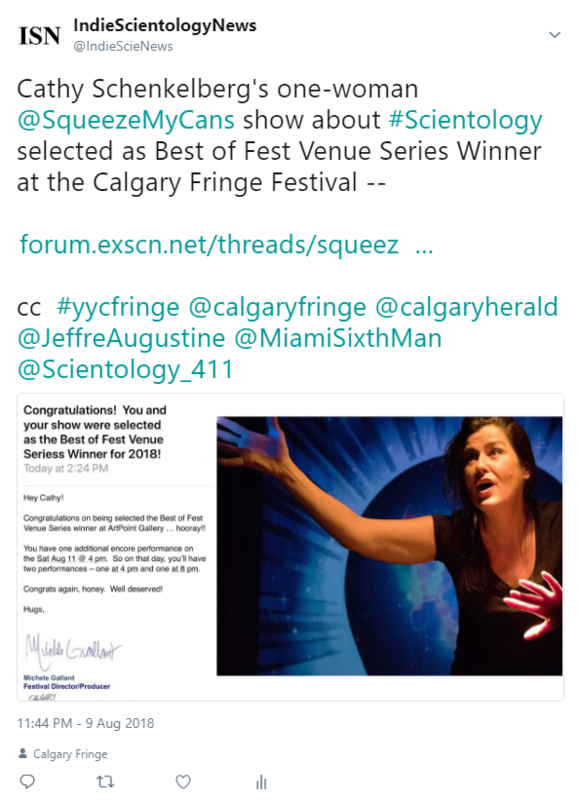 Cathy Schenkelberg's Squeeze My Cans show about Scientology was awarded Pick of the Fringe at the Vancouver Fringe Festival. VIDEO: Artist interview with Cathy Schenkelberg regarding her one-woman Squeeze My Cans show on Scientology. 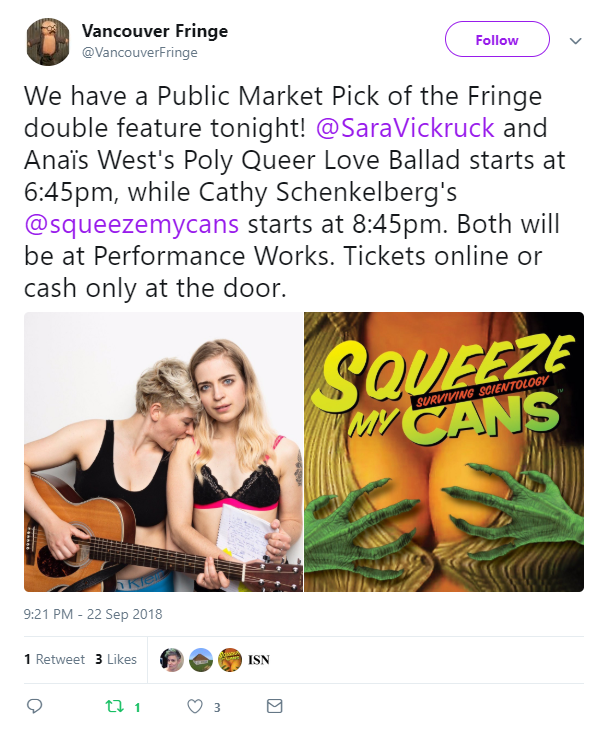 Squeeze My Cans named one of six Pick of the Fringe shows held-over for encore performances. Squeeze My Cans is Cathy Schenkelberg’s journey as a Nebraska Catholic girl from a family of ten, through the rabbit hole of the infamous cult of Scientology, represents an every-woman’s story of a young adult searching for her place. Playing Saturday, September 22 at 8:45pm. 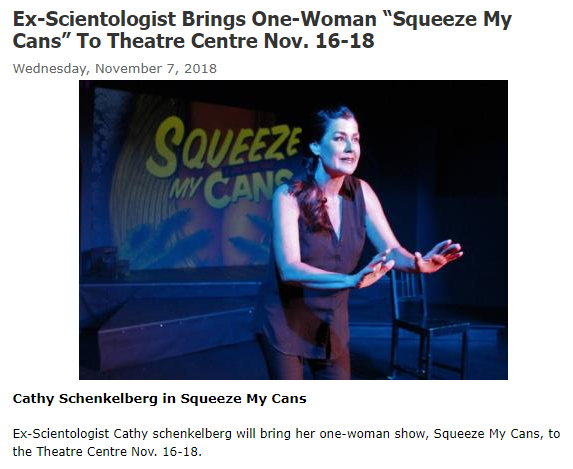 Ex-Scientologist Cathy Schenkelberg Brings One-Woman “Squeeze My Cans” Show About Scientology To Theatre Centre in Chattanooga, TN November 16 - 18, 2018. 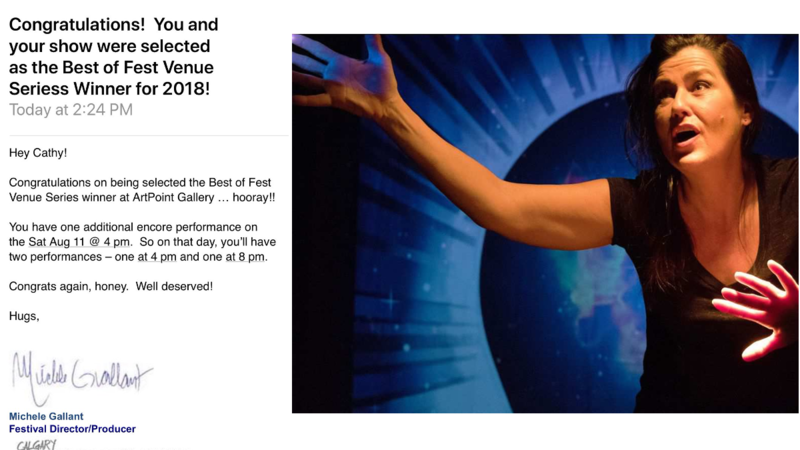 The Chatanoogan: Ex-Scientologist Cathy Schenkelberg Brings One-Woman “Squeeze My Cans” About Scientology To Theatre Centre in Chattanooga, TN November 16 - 18, 2018. Performances on Nov. 16-17 begin at 8 p.m. The performance on Nov. 18 starts at 2:30 p.m. Admission is $20. Tickets are available at the Theatre Centre box office at 267-8534 or online at TheatreCentre.com. The Church of $cientology had actress Cathy Schenkelberg for 14 years, and in her original solo show SQUEEZE MY CANS, she narrates the roller coaster ride down the “rabbit hole” that was her life.Simultaneously hilarious, heartbreaking, and redemptive, SQUEEZE MY CANS is more than just an audition to be Tom Cruise’s girlfriend. In 75 minutes Schenkelberg takes you on her journey of a 20-something looking for her place and purpose in the world…and comes out two decades later (and about a million dollars poorer). 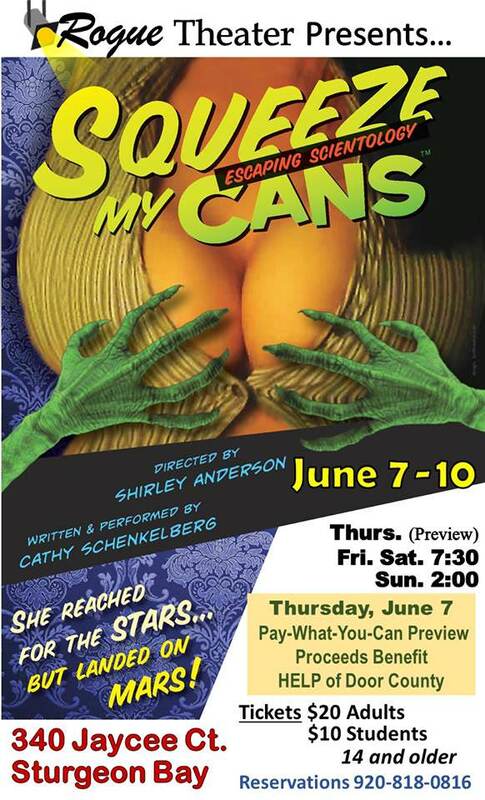 Directed by Shirley Anderson, SQUEEZE MY CANS is afunny, intimate, and shocking story about the power of survival through persistence and humor. "Edinborough Fringe Festival"? I assume this is the American pronunciation of Edinburgh, which is actually pronounced Edinbruh or sometimes Edinburuh. They've got the state of Arkansas don't forget, that's probably confused a few foreigners in its time.